Winner of "Best Documentary" at the Comic-Con Film Festival, STRIPPED is the ultimate love-letter to comic strips, bringing together the world’s best cartoonists to talk about the art form they love, and what happens to it as newspapers continue to lose their importance. FOCUS PRE-ORDERS ON ITUNES, FOCUS ON SITE SALES AFTER. STRIPPED mobilized their existing fans — including their crowdfunding audience — asking them to pre-order on iTunes on the day before the film was released. They had a coordinated surge of pre-orders which helped them debut as #1 in the documentary category on iTunes when the film was released. That placement helped them find new fans and also triggered favorable placement elsewhere on the iTunes store. After release day, they promptly switched promotional emphasis to their own website in an effort to convert some of that momentum and buzz into direct sales. In essence, iTunes not only helped drive sales, but served as marketing for the film overall. FULFILL CROWDFUNDING REWARDS WHILE ALSO OFFERING OPPORTUNITIES FOR UPGRADES. 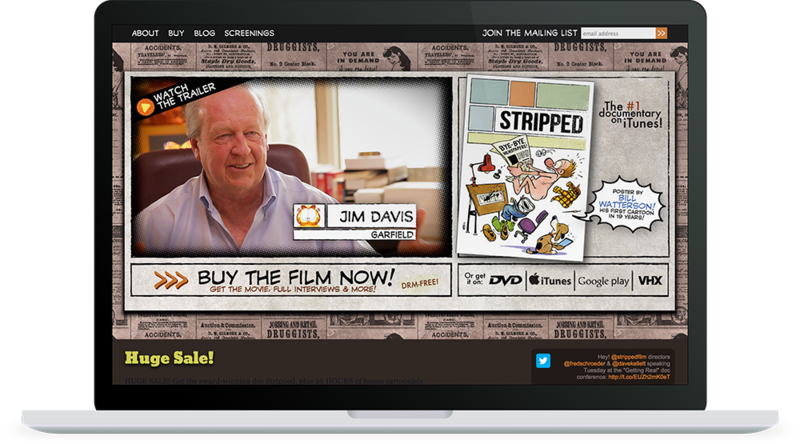 In total, Dave and Fred offered over two dozen products for sale on the STRIPPED website. These ranged from unedited interviews for $2.99 to a super-sized edition with over 25 hours of content for $65. With these products, fans could dig as deep as they wanted, and the filmmakers were able to monetize tons of extra material that would otherwise be unused. 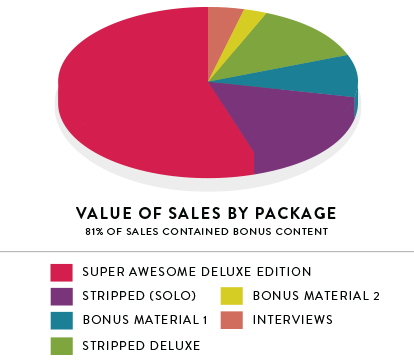 Customer data from Vimeo OTT showed that 55% of bonus content sales came from existing Kickstarter backers.